Surfing is a creative “dance” that underpins a “culture of pleasure” (Booth, 2003). The “visualising research opportunity” presented an occasion to promote Edith Cowan University’s research profile and Rob Holt’s ethnographic work involving the Cape Naturaliste surfing subculture. The comic style art that visual art student Kate Hoolahan produced wonderfully reflects the research in edgy style. Kate has captured the essence of the Cape Crusaders. 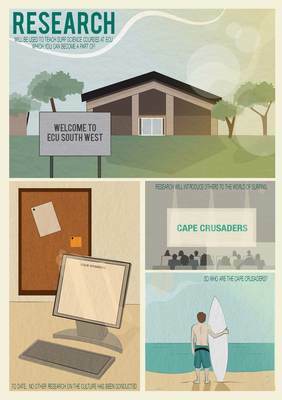 Her engaging illustrations serve as an artistic medium to stimulate interest in this PhD project and in the Surf Science program at ECU South West.